Let’s plan round two of our cookie campaign! I need your help so we can plan our 2nd Annual Cookie Campaign. Our next event is set for October 5th (or the week of if you can’t make this date). My biggest issue is that I am having trouble deciding on a date. While I would love to see an October date (for various reasons), I think that could possibly be an issue for some. I say this because I would REALLY like to make this an event you can do with your children. Involving them not only adds to the fun but it is important to instill that sense of community, giving, and stewardship at an early age and continue that through all the years that you are able to help mold them into the amazing adults they will soon become. 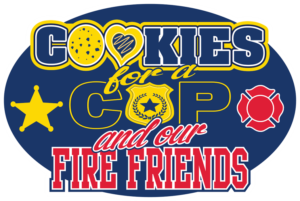 In 2014, we were able to, in less than 3 weeks, take an idea and turn it into over 30,000 cookies for over 15,000 officers / support staff in 24 states, I know we can do even better with more time to plan and spread the word! I’d like to hit 100,000 cookies this time around and for that, we are going to need more friends, more states, and more people who want to send the message that our officers are not the enemy – they are our HEROES! Fill out the following so I can start planning our attack. Please share with anyone you feel may have interest as well! Let’s make this happen! NOTE: If you have not yet been officially approved, you will be contacted shortly. Filling out this form does not guarantee approval for your desired department. I will contact you after your submission has been sent. If you were approved in 2014, great news! You are in…but I still need you to fill out this form so I know you are up for another year! Our #1 priority is to make sure we best protect those who protect us. Our#2 priority is making sure they know they are appreciated. Hey Robin! I am so excited you are on board for 2015! Fill out the form (I don’t show you are listed yet) so I can have you officially on the roster for this year and know what dates work best for your family. I hope WE do! This is not a one person thing and would NEVER happen without the work of thousands across the country. I appreciate your help once again this year, Dennise! My family would love to help bake and deliver cookies! My daughter’s and I have delivered to three police/sheriff departments, but I’m not sure if we are officially on the list. Amy, have we talked in the past? Did you fill out the form for this round? If I sent you the official tag, then you were probably approved, if not, we can take are of that in the coming days / weeks once I get to working on the list that pulls from this form. I see you on the list! I will be in touch soon! Cannot thank you enough for heading this up. Support is needed now more than ever. I look forward to doing this again. I am so, so excited you are back for this year! I will be in touch soon but know since you have been approved for the leadership role there, you are already cleared! Such a wonderful thing you are doing. Looking forward to being part of it again this year. I am excited to have you on board Susan! I will be in contact soon. WOOT! Watch your inbox. I am going to pop you a quick message now. We are looking forward to round two! Last year was amazing and much needed for our deputies. Thanks for your servants heart! God bless.